Most years in our household, Christmas dinner is one of the most memorable meals of the year. 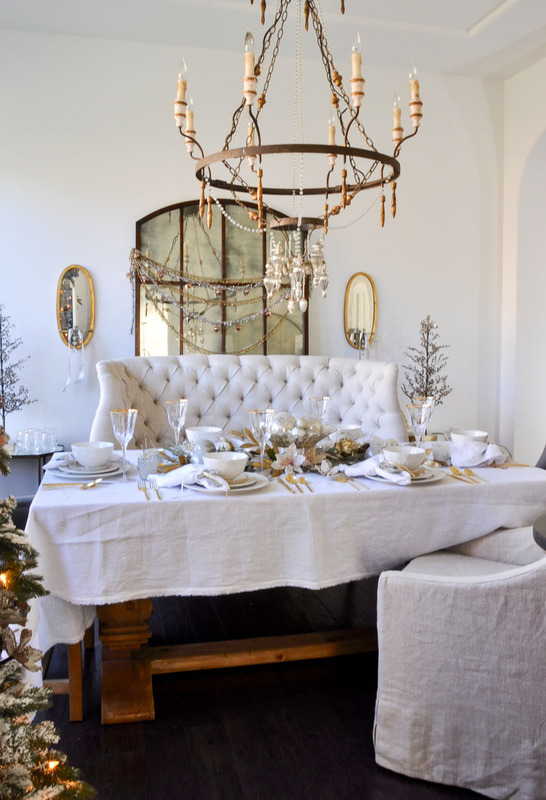 And creating the perfect Christmas dining room can make it extra special. No matter who is cooking (usually Tony in our house), I know the meal will be delicious. 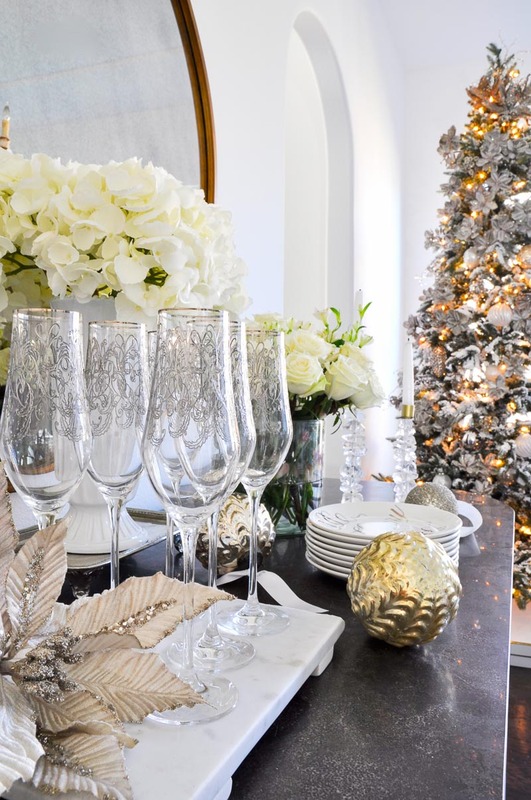 My job is to make our Christmas dining room look equally special. That is what I want to share with you today. 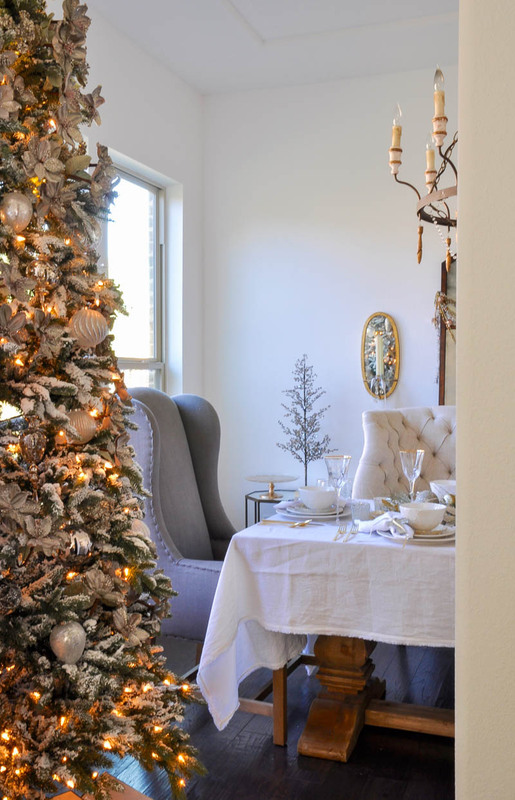 At the end of my post, you can find a link to my friend Randi Garrett’s Christmas dining room which is beautifully decorated and will provide you with more Christmas styling ideas. 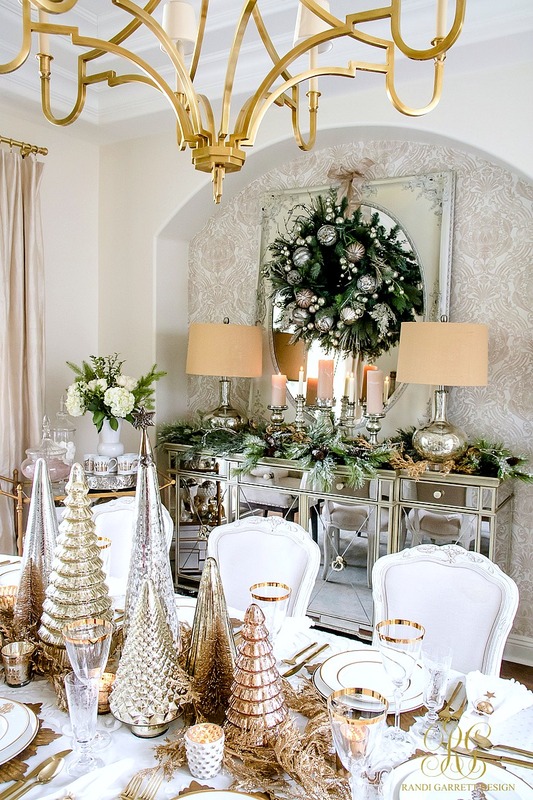 Welcome to my Christmas Dining Room! 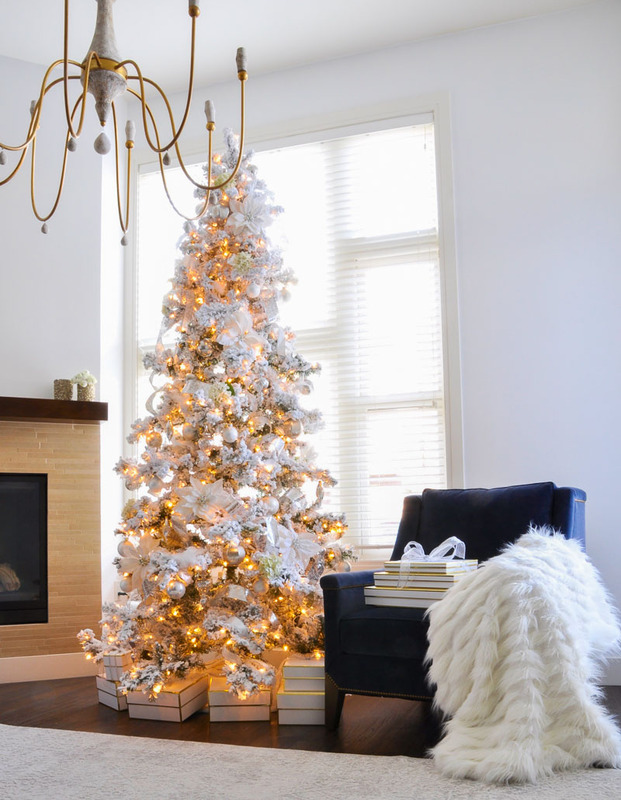 We love to include a slender tree in this room. 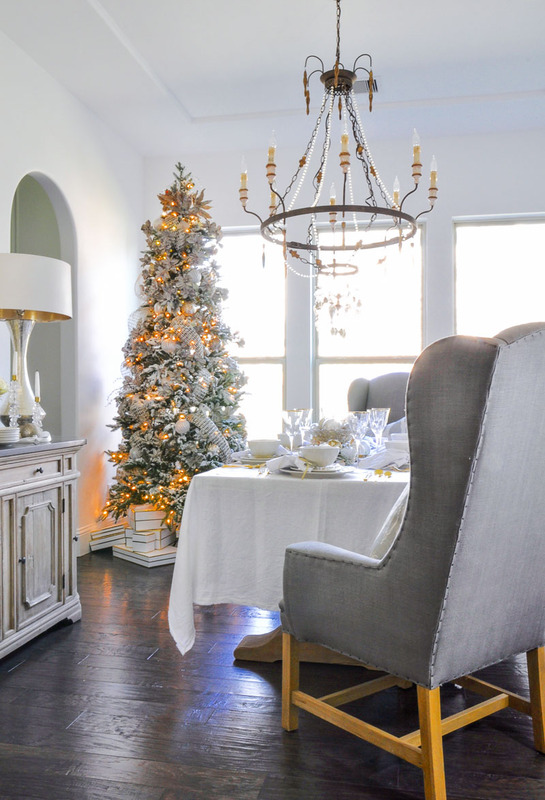 Try placing your tree across from a mirror to increase the ambiance the lights provide. 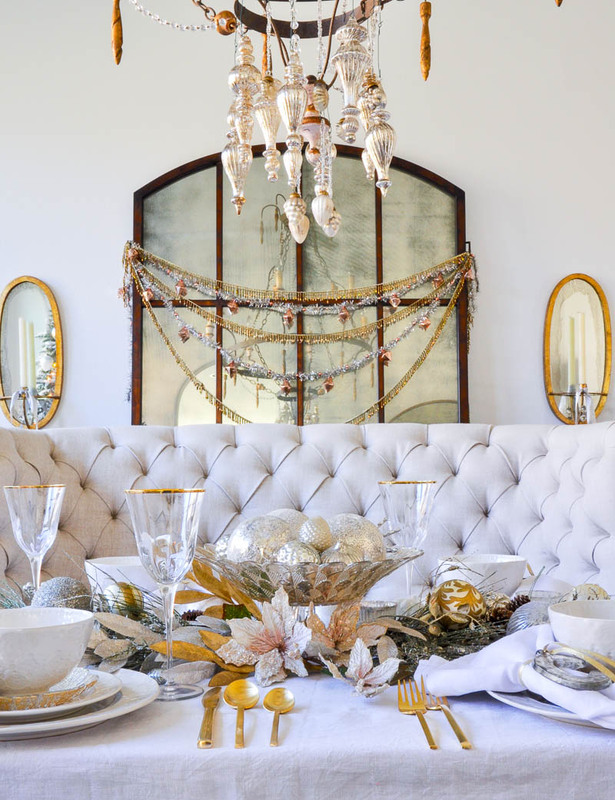 My mirrored gold sconces are favorite accessories, especially this time of year. I flocked our tree last year with SnoFlock to give it a snowy look. It took a few hours, but I love the end result. 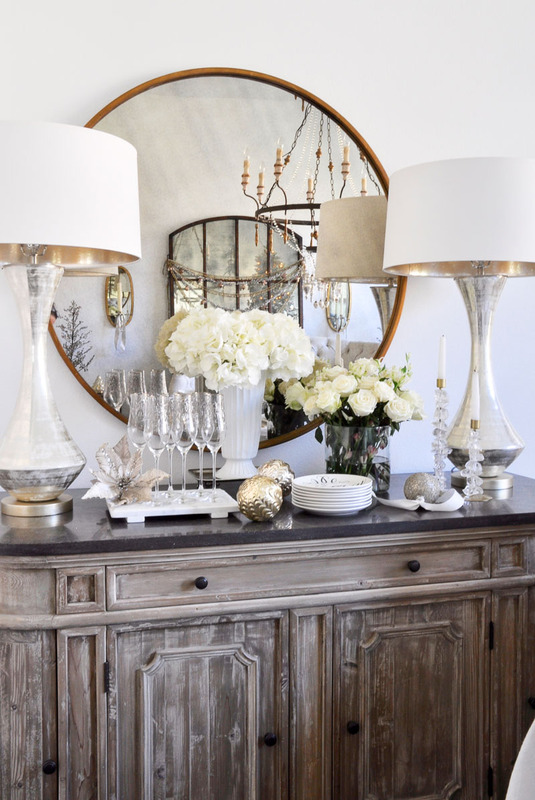 Our new sideboard is well stocked with glassware and dessert plates. It was a wonderful addition when I recently updated our dining room (full story HERE). Unfortunately, the sideboard is now discontinued, but it is by Aidan Gray and they have some beautiful pieces that are similar. 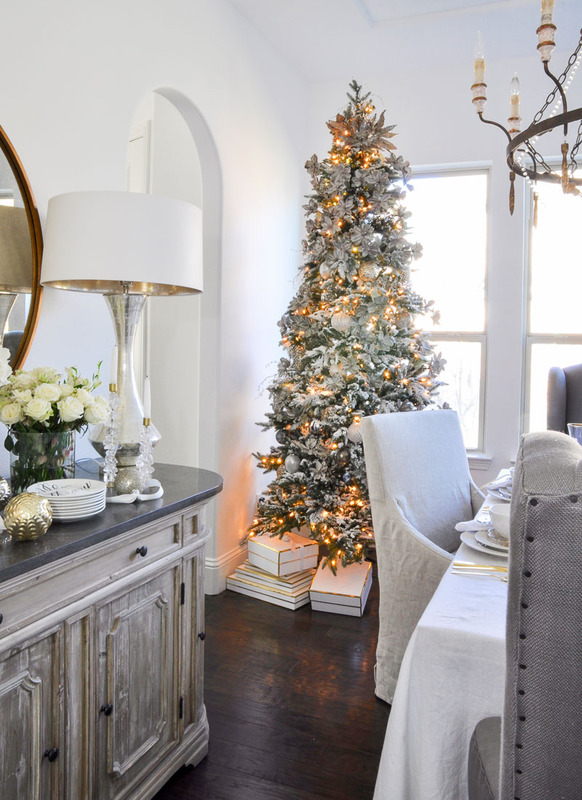 You can make your own sideboard or console decorative and also functional by adding a few ornaments, candlestick holders, and accessories to the items you will be using during your holiday meal. Vary the heights of the items on your console with stands like the marble one I used to contain my champagne glasses. Try mixing metals for a collected look. 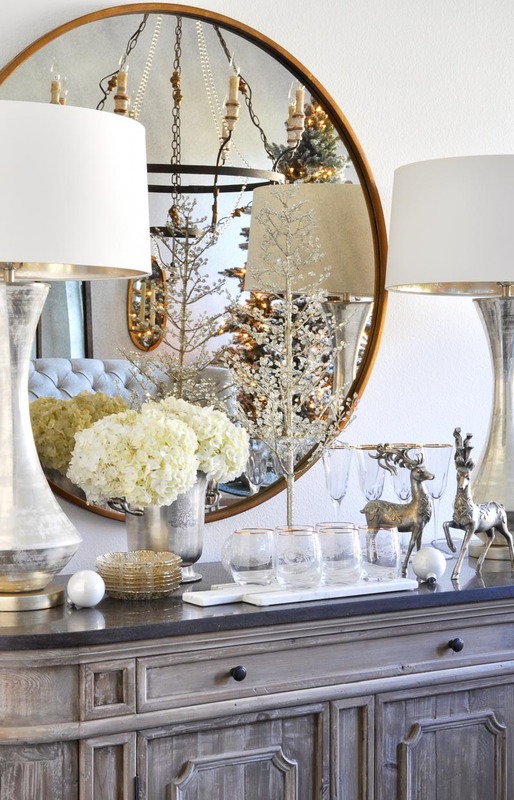 I recently added this new round mirror and tall lamps in brass and silver. The lamps are another Aidan Gray find. I’m sure you can tell, I am a huge fan of their beautiful products and have many in my home. 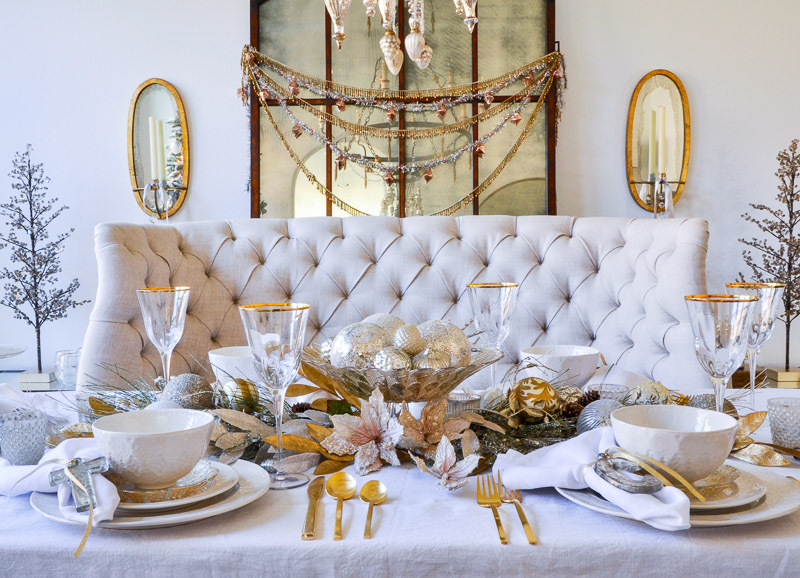 I love to set the table a few days early so I can enjoy it a little longer. I made a centerpiece with Christmas sprays, ornaments, and a few votives. 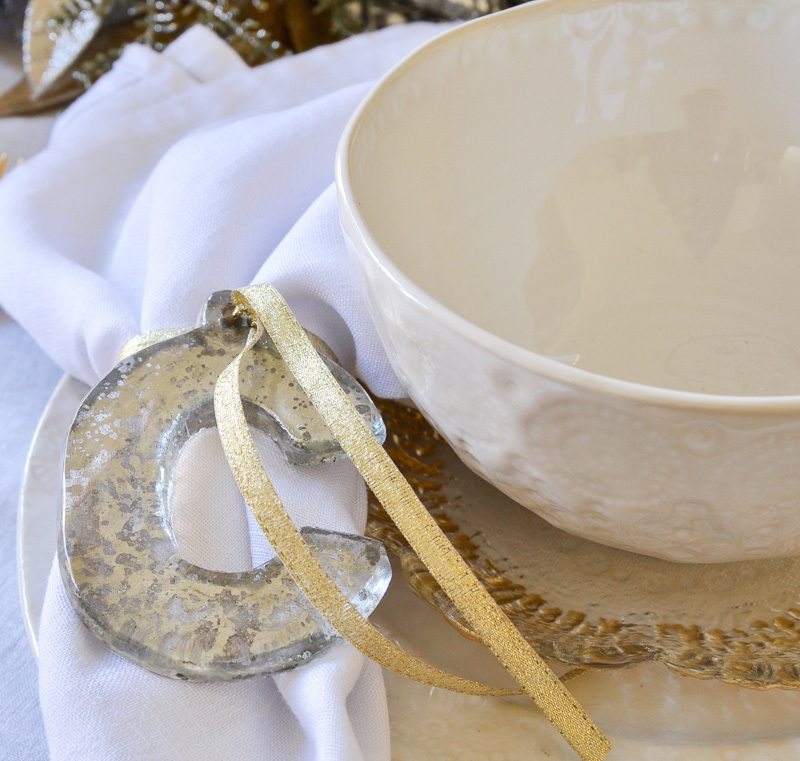 I also elevated additional ornaments in a footed gold bowl. I used items from my home and it took only a few minutes to put together. 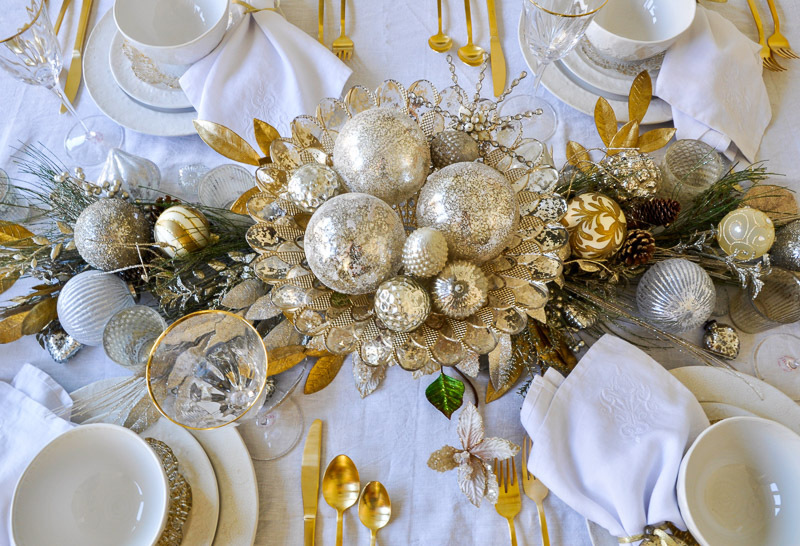 Gold rimmed goblets, gold flatware and white dinnerware look great together. 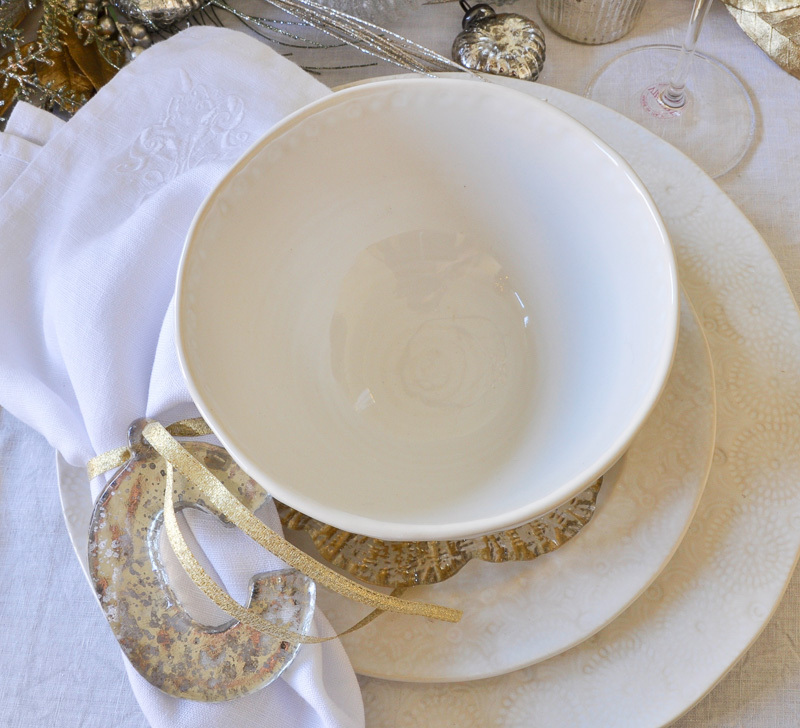 I included gold glass canapé plates for an extra bit of glam. Rather than making place cards, I simply tied initial ornaments to the napkins. 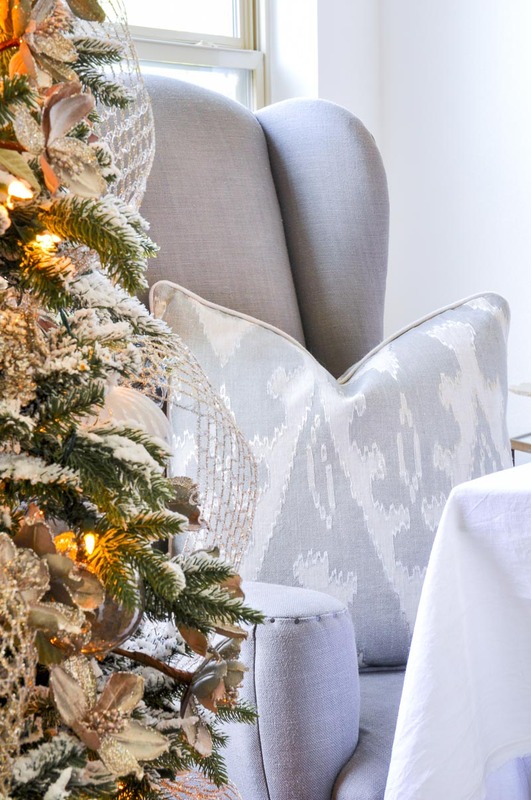 Once our family, friends, and guests arrive, during the Christmas holidays, I want to sit back and relax with them. So, having the table set early also means I won’t be scrambling to do it that morning. We use comfortable chairs to entice our guest to spend some extra time at the dinner table. 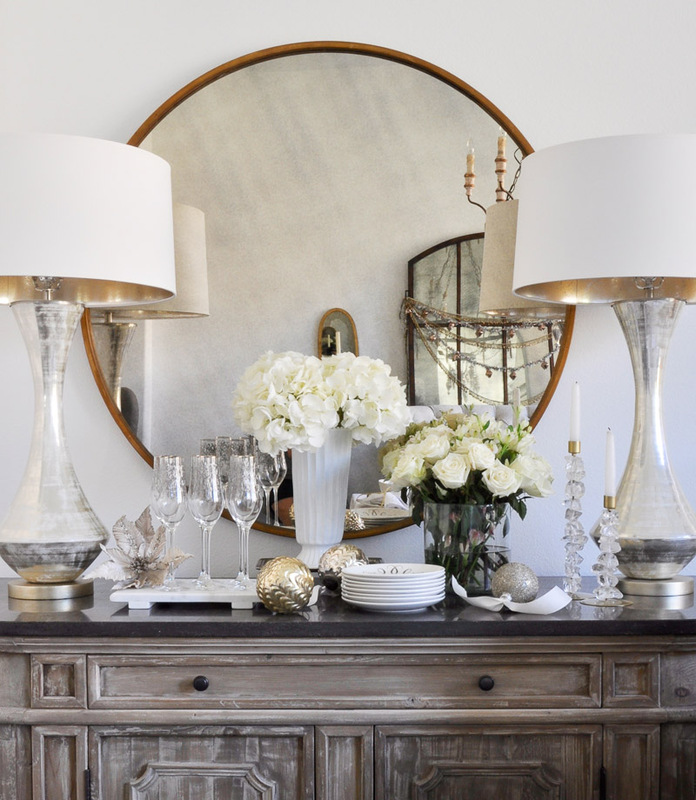 (Read more about this and other dining room styling tips HERE). We installed a dimmer on our chandelier to give the room a soothing glow. 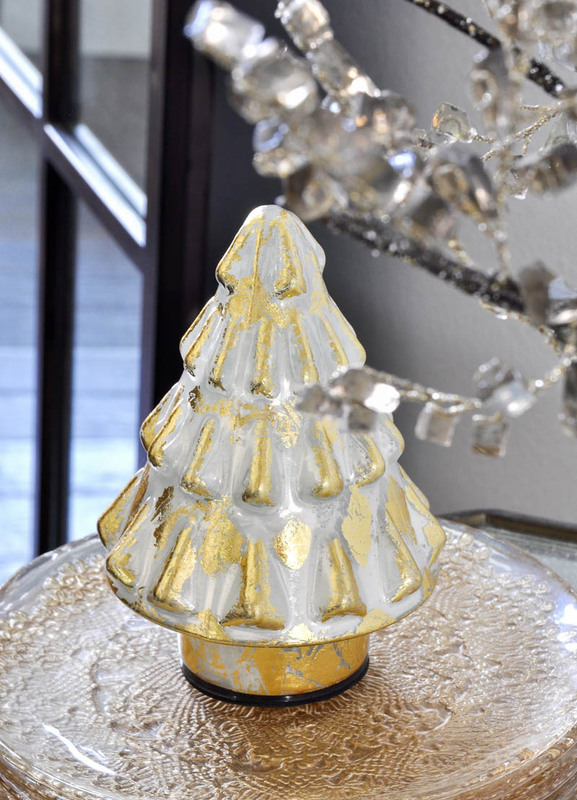 In addition, I simply added glass ornaments to it. 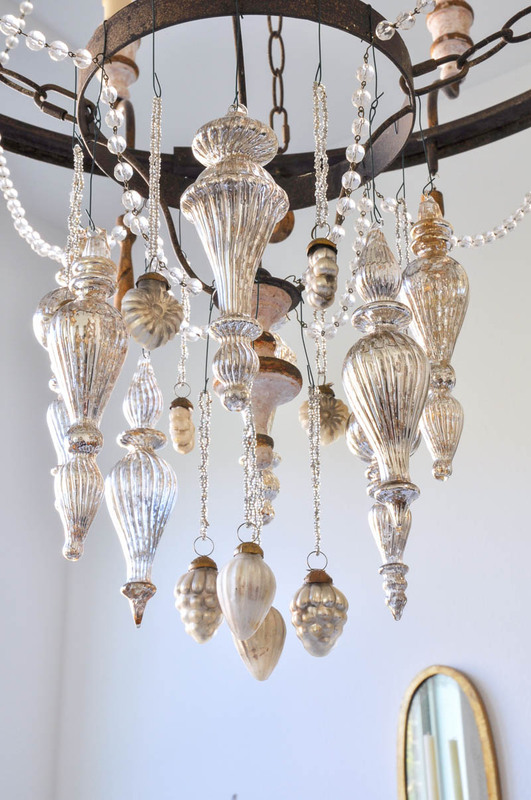 You can add any style of ornament to your light fixture if the style allows. 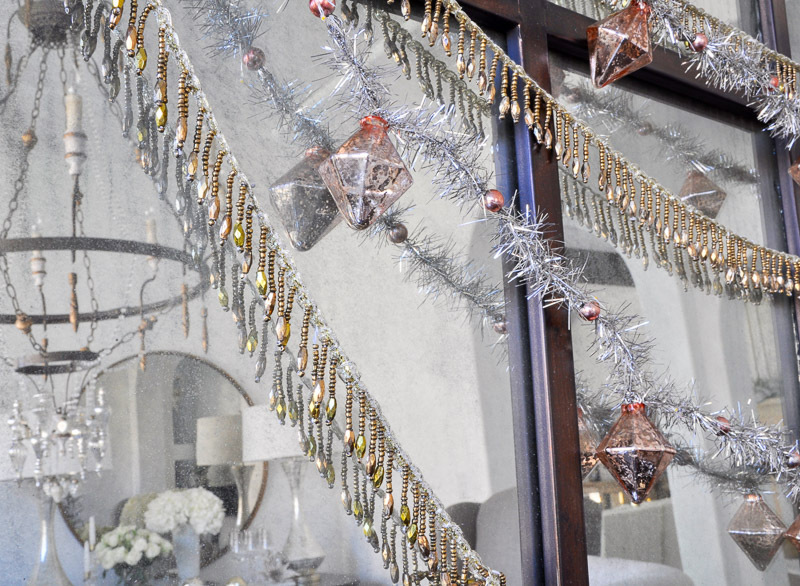 Hooks work well, but I also like to use floral wire when I want to stagger the ornaments as I did this year. 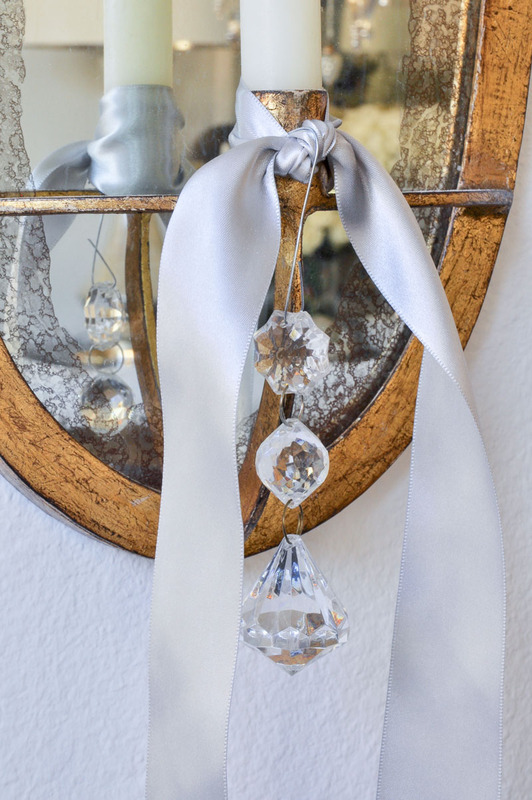 Ornaments and ribbon also hang from our wall sconces. 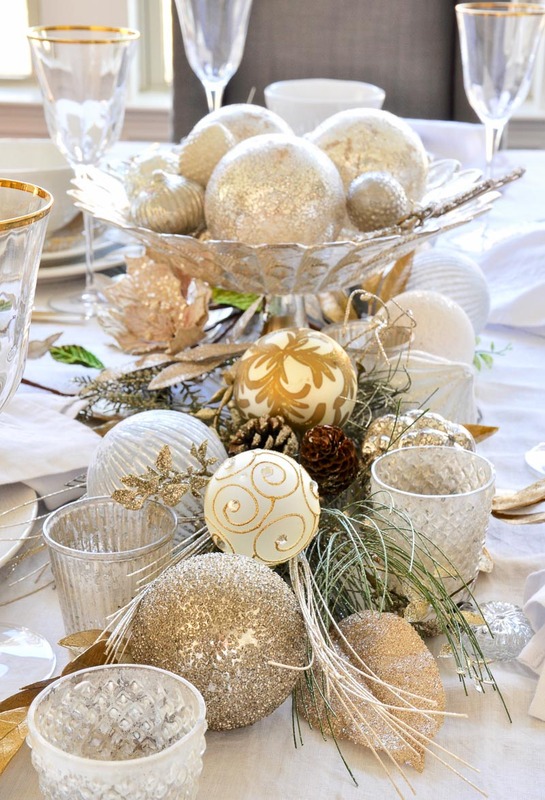 (See additional ways to use ornaments HERE). 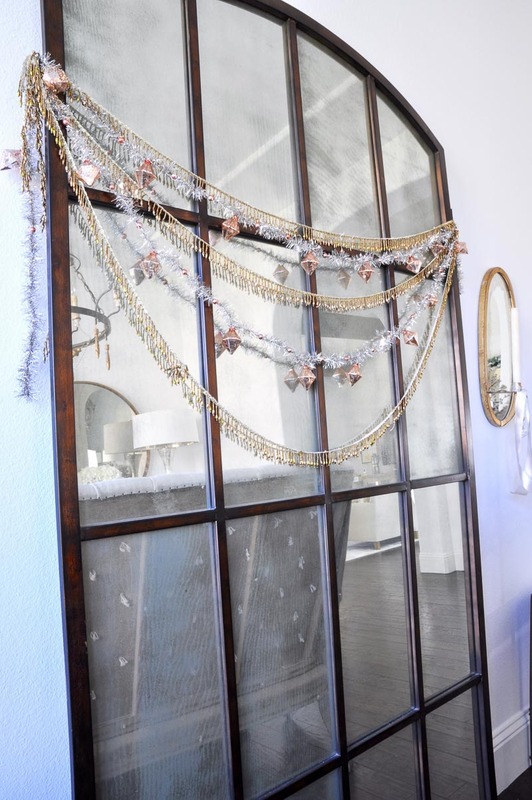 Tinsel garland (which has lights and a battery pack) and gold beaded fringe provide a festive addition to our leaning mirror. Even though I used traditional Christmas colors (silver, gold, and white), I arranged some of my decorations in non-traditional ways. 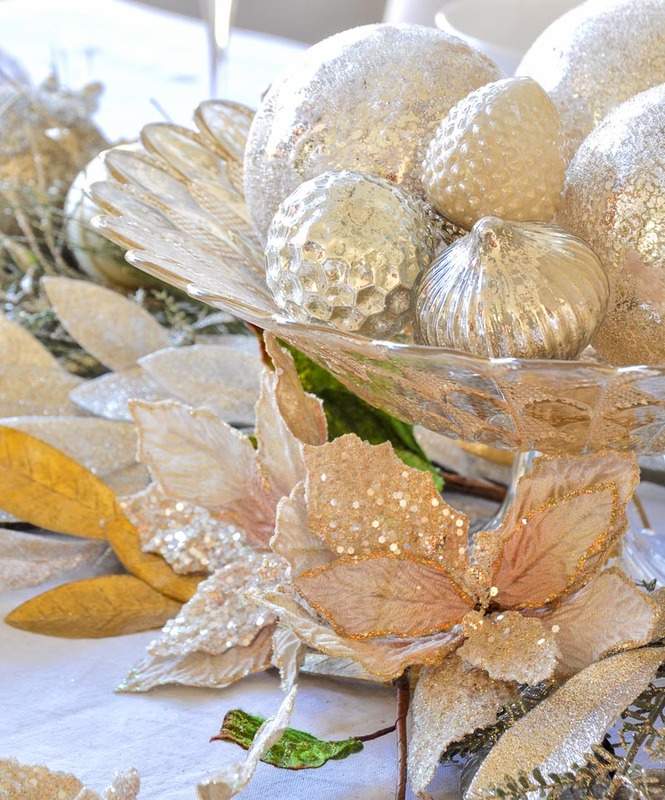 It is a great way to give your holiday decor a new look each year. 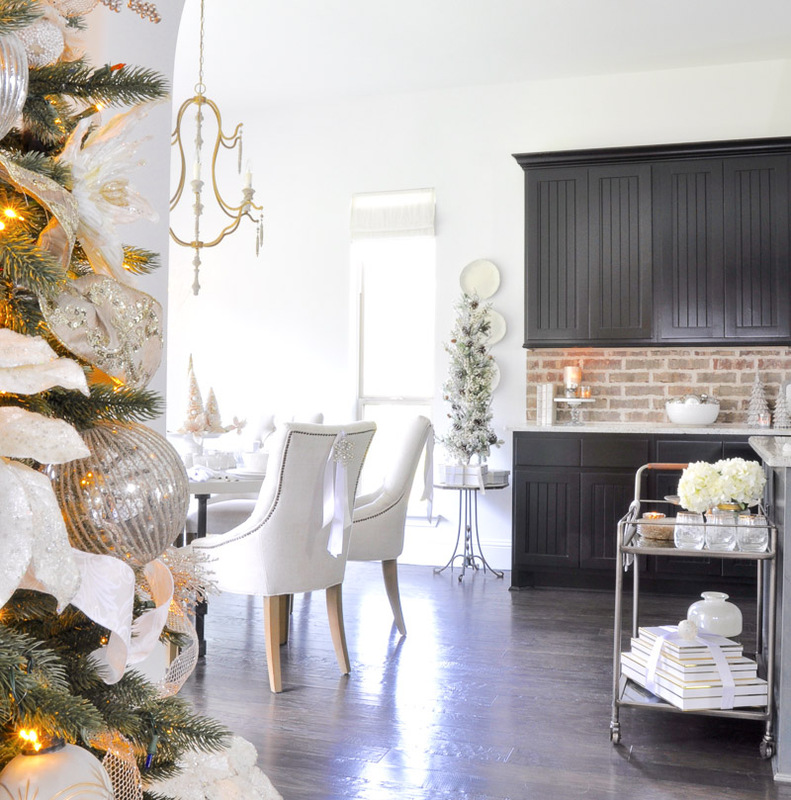 I hope you found a few inspired ideas to help you decorate your own Christmas dining room. I’m so grateful for the time you spent here today! 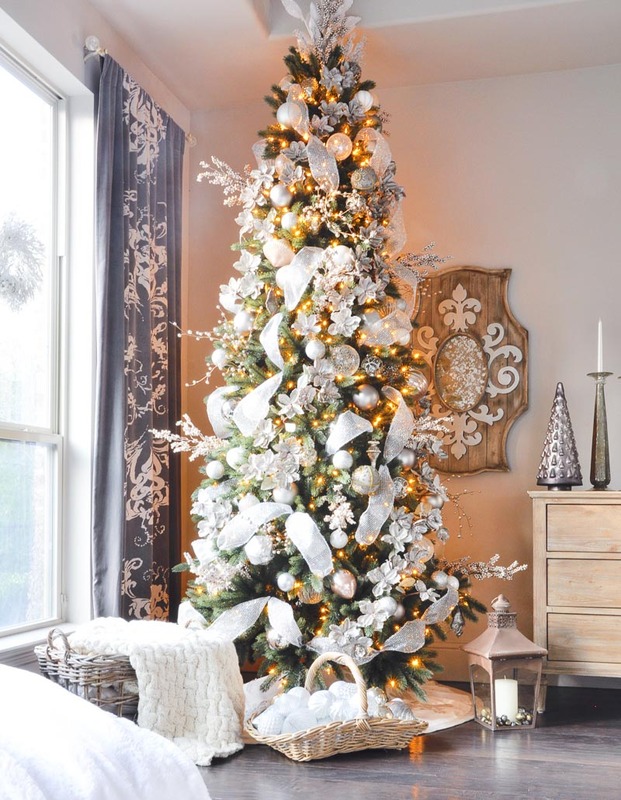 Don’t miss additional Christmas posts along with a link to Randi Garrett Design below!!! 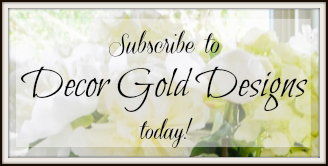 Now, please take a moment to visit Randi Garrett Design. If you are a regular here, you have likely visited Randi before. If not, you are in for a huge treat! I love, love, love what you have done. I would like to know what are your wall, molding/trim, ceiling paint colors? Thank you Stacy! 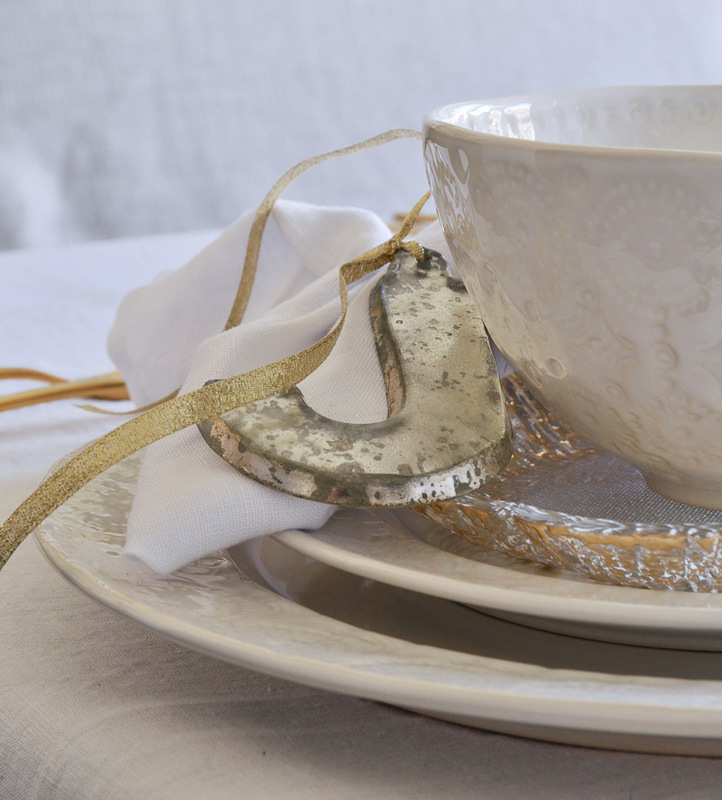 All surfaces are Benjamin Moore Chantilly Lace.